Many photographers won’t bother to dive if they don’t have their cameras. Non-photographers don’t understand this. IN THE LAST PART of this mini-series I deal exclusively with matters of etiquette surrounding underwater photography. Not everyone will agree with my recommendations, and I’m sure the more experienced among you will have your own particular opinions and bugbears. But that’s all part of the fun. In my career in diving I’ve often been called on to deploy my legendary diplomatic skills to defuse potential flare-ups between photographers and non-photographers. The reasons behind the heated debates are always the same and, having been both a photographer and a non-photographer, I think I can see both sides of the argument. So here is a quick guide to the major issues, presented in the hope that mutual understanding will promote greater harmony. Here is the problem in a nutshell. 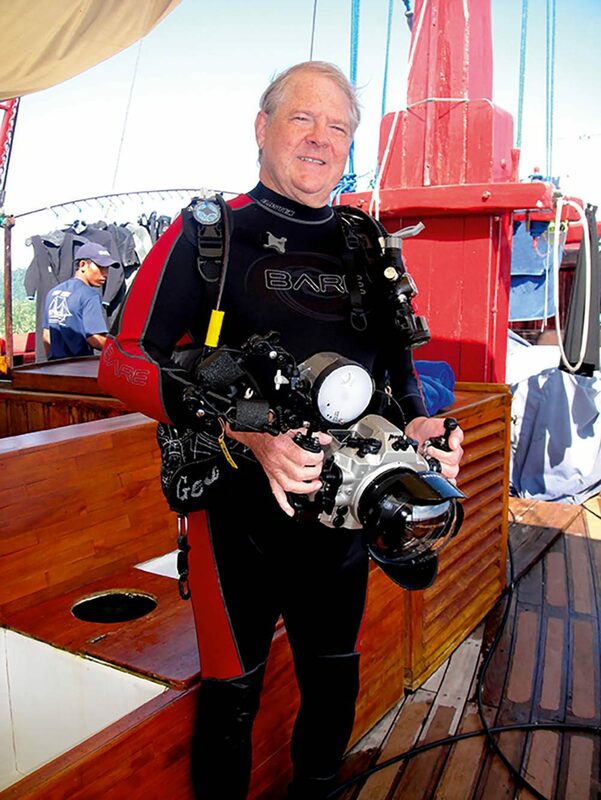 Many divers don’t care about taking pictures under water, nor do they have any idea of how much financial sacrifice it takes to buy an underwater camera system. Underwater photographers are often accused of callously damaging the seabed and the plants and animals that live there while they are manoeuvring to get a good angle for their pictures. 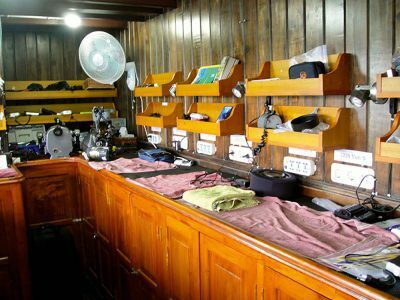 Dedicated camera room on the Damai 1 liveaboard in Ondonesia. In their defence, most photographers do not deliberately set out to wreak havoc on the reef. However, burdened as they are with the destabilising potential of a camera and strobe system, and with the technical limitations imposed by the behaviour of light under water requiring them to get close to their subject, occasional accidents are hard to avoid. Furthermore, with their focus on what is going on in front of the lens, photographers are often oblivious to the peripheral impact of what they’re doing. This can be misinterpreted as carelessness. It isn’t always the case that someone poised against the reef, camera in hand, has just landed there unthinkingly. He might have carefully chosen this particular spot specifically to avoid damaging anything, and deserves the benefit of the doubt. What is less excusable is the propensity of some photographers to manipulate their subjects into places where they can be seen more clearly, away from the environment that conceals them; an environment that they have chosen for their protection and which they have evolved to copy. This can render them highly vulnerable to predators. Touching marine life can also damage it or make it susceptible to disease. Quite apart from offering us an uplifting experience, underwater photographs serve a valuable purpose by sharing the beauty and wonder of the creatures beneath the sea with those who cannot see them for themselves, and who may thereby be more likely to support environmental causes. But perhaps before photographers remove a delicate animal from its camouflage; before they wriggle themselves and their gear through a fragile eco-system in pursuit of their quarry; they should ask themselves if the end justifies the means, and if the photograph is really that important! Cameras, housings and strobes are all delicate pieces of engineering and highly vulnerable to water, so common sense suggests that you give the photographer and his gear plenty of space. A camera-table is for camera-related items only, so don’t put a drink down anywhere near a camera, and remember that when you’re wet after a dive, so is your hair. Craning your head over the shoulder of a photographer as he runs through his pictures post-dive can cause drops of sea water to fall onto delicate electronics. Photographers need to take a certain amount of responsibility too, and make sure that they keep their precious and ultra-expensive equipment out of the way of the uninitiated. Remember that they’re divers, so are going to be excited when they come up from their dive, and the security of your camera system is not going to be uppermost in their minds. 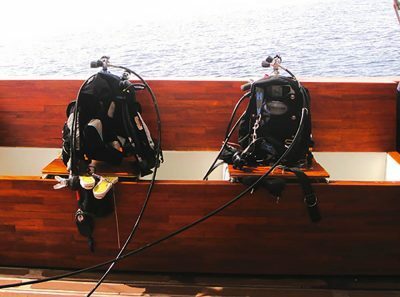 The best dive-boats and resorts have camera-only areas, even private rooms, just for photographers. The generally accepted convention is that while photographers are busy with a subject, it is theirs until they have finished with it. It is not done to intrude, either to take a peek at what they have in their sights or to crack off a quick snap on your point-and-shoot. However, photographers need to be considerate of others who might want to see the animal too, particularly if it is something unusual. Good etiquette dictates that a diver without a camera has just as much right as a photographer to see, watch and examine an animal. If divers want to savour the moment and burn the image of a rare creature into their brains rather than onto a digital card, that is their choice. So photographers should take their pictures promptly, then leave. If they want to come back to the animal, they can join the holding pattern and wait until everyone else is done. When they see photographers in action, other divers should steer clear and be aware of how their positioning in the water might affect the shot the photographer is striving so hard to perfect. Passing carelessly upcurrent of a photographer can cause the debris of your passage to drift into the viewfinder. Swimming below a photographer working on a reef wall and exhaling will create a snowstorm of expanding and exploding bubbles all over a meticulously framed backdrop. In the panel are some suggestions for photographers and their buddies, designed to ensure that they both get the most out of a dive. Not all photographer/buddy relationships work well. Like every good relationship, it comes down to empathy, mutually compatible priorities and shared objectives. You may have noticed that I have not dealt with the issue of two photographers diving as a buddy-team. The main reason I have avoided this is because I believe it to be an impossible thing. Photography is such an individual, single-minded pursuit that the likelihood of two photographers being able to stay together and work as a team while dedicating themselves to their respective goals is so remote that to try to suggest rules of etiquette would be futile. Discuss the roles you’re going to play and the division of responsibilities before the dive – and make sure that you agree. See the safe completion of the dive and the acquisition of great photographs as joint achievements. Remember that, as the person with the camera will have their eye on the viewfinder most of the time, it is the non-picture-taking buddy who is mostly responsible for keeping the pair together. However, good etiquette demands that photographers indicate to their buddy that they have seen something, and make sure the message has been received before stopping and settling down over a subject, so that the buddy does not just swim off into the blue alone. However reliable and devoted a buddy is, the photographer should take care not to fall into the trap of shifting the burden for staying within the dive-plan onto the buddy’s shoulders. A basic rule of scuba-diving is that a diver’s air supply and decompression schedule are his or her own responsibility. While the photographer is busy, buddies can keep in sight and try to find further targets. If they find something cool, they should wait and watch for the photographer to look up, then raise their arm to draw attention. Photographers should take time to snap a few photos of their buddy during the dive and make a gift of them afterwards. Most people don’t have many pictures of themselves under water, so will be grateful.